To Sum It Up: Nikki Beckett has just spent six months in the underworld known as the Everneath, a place where immortal beings known as the Everliving feed off of the energy of humans. Now Returned to the Surface, she has six months to say goodbye to her loved ones before she must go back to the Everneath forever. Nikki must choose either to become immortal herself and Feed off of others or become part of the Tunnels, the energy source that powers the Everneath. As Nikki steadily grows closer to her former boyfriend, Jack, she realizes that she must find a way to avoid her fate. 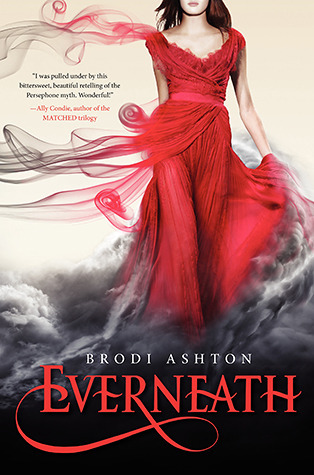 Review: Everneath was an underwhelming read for me. The writing is solid, and the story smoothly switches back and forth between the events leading up to Nikki going to the Everneath and the present. I just couldn’t get invested in the story or the characters. I also felt like I had missed some details on how the world of the Everneath worked. Why was Nikki allowed to Return to the Surface for six months? Why didn’t she have to decide between becoming an Everliving and going to the Tunnels right after the Feed? This system seemed kind of murky to me. Nikki wasn’t a standout heroine for me. While she doesn’t incessantly bemoan her fate, I don’t think that she’s exactly proactive about altering it, either. I understand that she wants to spend her remaining time on the Surface with her family and friends. I realize, too, that the Feed has drained her physically and emotionally, so she’s not in the best condition to put up a fight. As the novel went on, though, I never felt like I could rally behind her. Nikki’s boyfriend, Jack Caputo, suffers from the same lack of spark that Nikki’s character does. He’s a good guy with a good heart, but he’s a little too perfect for my liking. I found Cole Stockton, the immortal who Fed off of Nikki in the Everneath, more interesting because he had some edge to his character. Cole is the closest thing to a villain that you’re going to find in the book, but even then, just when you’re ready to peg him as such, he displays a tender side. Normally I’m all for morally gray characters, but with Nikki and Jack being the polar opposites of teenage rebels, I think that a truly evil bad guy would have added some welcome dimension to the story. I really liked the concept behind Everneath, a retelling of the Hades and Persephone myth, but less-than-compelling characters and a predictable ending made me glad that I borrowed this from the library instead of buying it. All in All: I don't plan on continuing with this series. There are books which I’ve given fewer stars to, yet I’m willing to read their sequels. That's because even though I might not have been crazy over a book, there’s a character whom I really care about, or I want to see how a certain plotline gets resolved. In the case of Everneath, none of the characters was especially memorable to me, and I'm not all that interested in whatever awaits them in the next book. Hmmm. Well its sad when you find a series that you expect to be good, and then it falls flat. Its even sadder when it falls so short of your expectations that you dont even want to finish the series! I dont expect to start this anytime soon. I did have high expectations when I began reading this because the reviews had generally been positive, but it didn't work out for me. The writing is very good. I just didn't find the story as captivating as other readers did, and it didn't leave me feeling compelled to read the sequel.